Out of love for our children, we’re on a constant mission to make everything better. But missions are for wars, not for human beings with loving connections. Yesterday morning I was waiting with my husband for his doctor’s appointment; the doctor was in his office with another patient and we were next in line. A woman approaches us, names the doctor and asks if this is the right office, I say that it is, and she knocks on the door. “We’re next in line” I said, with a strong emphasis on WE’RE. You see, I automatically assumed that she is cutting the line and trying to get in before us. I automatically assumed she is working against me. Well, she wasn’t. Her elderly mother was at the doctor’s office and she came because her mom couldn’t walk out without her. And if I waited patiently for another second, I would have learned that. But I didn’t. I judged. I judged quickly and poorly. This is what we all do, and we do it all the time because we are programmed to look for “what’s wrong”, we’re programmed to look for “who’s out to get us”. When our children choose to go against our advice, we feel they judge our parenting. When children try to go their own ways, we believe they disrespect us. When children are honest about their feelings, we tell them they can’t say those things. We take everything personally, we turn it against us, and then we fight because we believe this is the way to make it better. It’s an ancient programming from an ancient era in which our survival instinct had exactly one millisecond to decide whether the situation we’re in is dangerous or whether it’s safe, and trigger our fight/flight/freeze response. In most cases, that ancient programming would vote DANGER and compel us to fight – after all, it’s our survival we’re talking about, and it’s better safe than sorry, right? Even though it’s 2019, we are still governed by our survival instinct, the only difference is that now the binary programming of danger/safety evolved (devolved is more accurate) into the moralistic judgments of wrong/right or bad/good, and these judgments trigger us to fight. Just like they did millions of years ago. A crying child is bad, a quiet child is good. A “behaving” child is good, a child who “acts out” is bad. When something’s “good” – we embrace it. When something’s bad – we think we must fight to change it and make it “good”. We think we know what’s good. We think we know what’s bad. And we expect everyone do KNOW the same. And when they don’t… That’s where the fights begin. We believe everything has to do with us – if we like it – it’s “good”, if we don’t – it’s “bad”. But it doesn’t really have anything to do with us, does it? And it no longer affects our survival, does it? And the truth is that it’s not even our job to change it. This belief, that it has to do with us, further perpetuates the presence of “bad”, of behaviors that we wish to change, and of children who walk this world not being seen because we are constantly trying to change them. It further perpetuates singularity, the us-against-them mode, and the fighting. All that fighting. When we parent with judgment, when we make our parenting decisions based on the poor judgment of our survival instinct, we miss out on everything that’s actually happening – the actual life experience of our children, on the actual experience of parenting our children. There’s nothing binary in life, is there? And we don’t really want to fight, do we? To stop being your child’s enemy and to rewrite your state of mind, begin practicing acceptance, is feels so good. It creates so much good. The power to give up on what we think we know empowers us to ask. To connect. To love. Acceptance is the only state of mind that can actually lead to change. 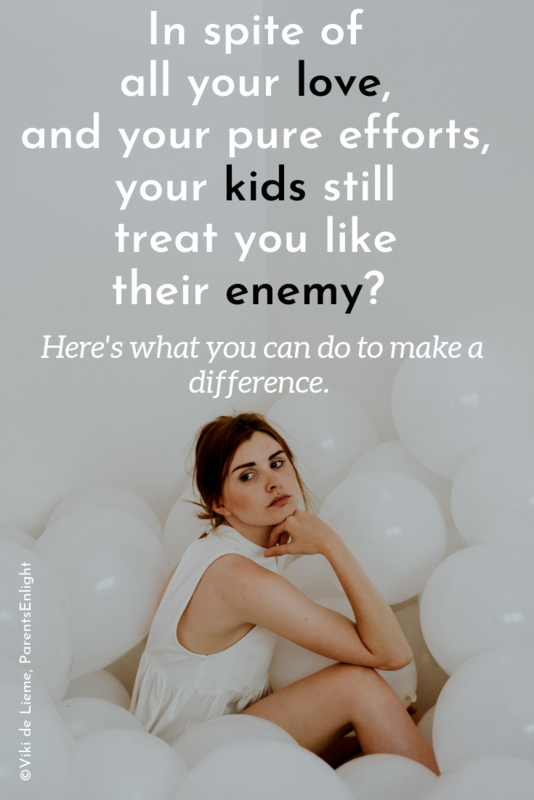 We’ve been taught that if we want to change something, we must actively and forcefully try and change it, but that’s the worst myth around parenting (and relationships in general). The changes that follow tactics of force are unpleasant, not free, not chosen. 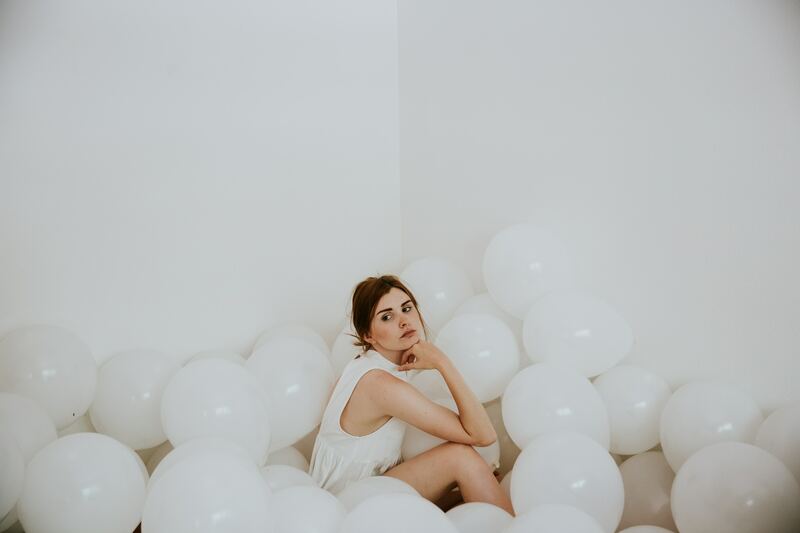 The changes that follow force are disconnecting, distancing, and lonely. Ever wondered why a child who was punished for something, will usually do it again? That’s the reason. Human beings are programmed to resist control in the same way we are programmed to classify everything into good or bad. And we automatically become the enemies for those we are trying to control, the ones we love most. Our children. 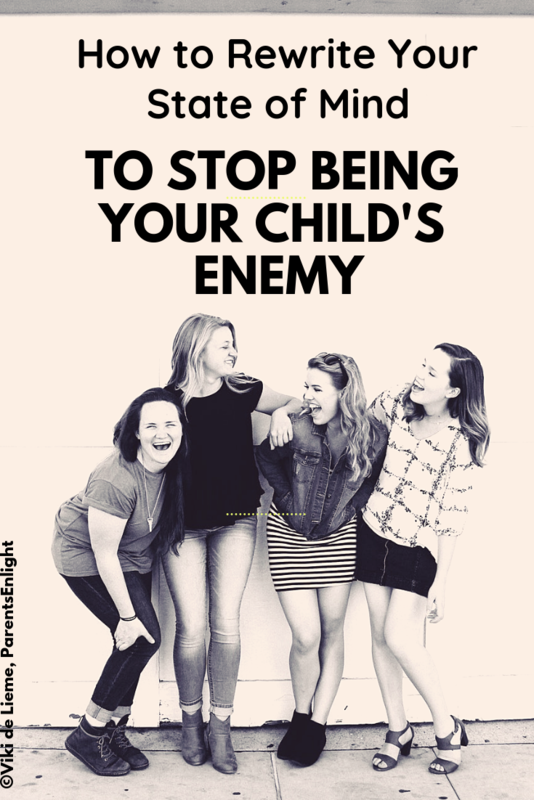 If you want to stop being your child’s enemy and to rewrite your state of mind, learn to accept the behaviors you cannot change. Ask yourself how and why these behaviors initially came about, what needs were they meeting, what other ways are there to meet the same needs. Ask yourself with curiosity, with compassion and empathy – and the change will come. Peacefully. As soon as you’ll stop trying to force it. And if you need help, I’m here for you. And your first session is always free. And you can claim it right here.